Anthony Perez Rodriguez cried in court as he was sentenced Friday to six years in prison. Anthony Perez Rodriguez cries at the sentencing in a fatal DUI crash which occurred July 2015. The family of a woman killed on her way home from her mother-in-law's deathbed asked a judge to go easy on the man who caused the fatal crash. 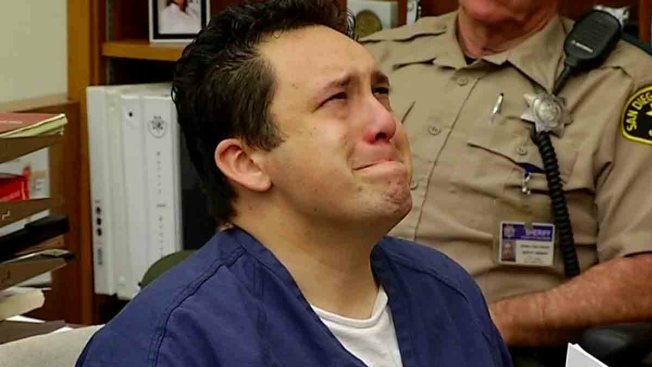 Anthony Perez Rodriguez cried in court as he was sentenced Friday to six years in prison. He could have recieved up to 10 years behind bars. Rodriguez was traveling on Carmel Valley Road on July 22 when his vehicle collided head-on with a car driven by Chula Vista resident Enid Diane Mayer-Sheaf. Mayer-Sheaf was driving home from saying goodbye to her mother-in-law when she was killed. Within a few hours her husband lost his mother and his wife. Family members asked the judge for leniency as they did not think prison would reform Rodriguez. "I don't think the prison term is going to be the answer to the problem," said the victim's husband Danny Sheaf. "Alcohol is out there and [...] people take advantage of it and they wind up making mistakes." "If he truly regrets and understands the dangers of alcohol, I would want you to look towards leniency in deciding this matter," the victim's son Christopher Sheaf said Friday. After undergoing a roadside sobriety test, Rodriguez was taken into custody on suspicion of DUI. His blood-alcohol level was measured at 0.16 percent or twice the legal limit two hours after the crash.